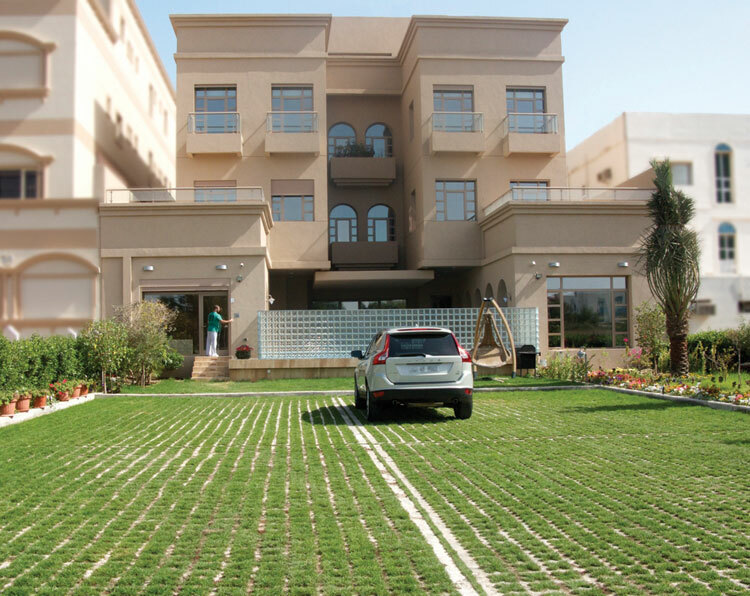 With increased demand for grass paving to driveways, access roads and parking for both commercial and domestic applications, there are certain aspects of both ground conditions and utilisation that building specifiers and installers should consider. By Robert Howden, managing director of Grass Concrete Limited. Today’s variety of grass paving systems means that specifiers now have a wide choice of products, together it seems, with an equally wide range of performance and sustainability claims. Without the clear guidelines of an industry standard it is possible to end up with a product that might be fine in the short term, but will not stand the test of time, and in turn, not achieve any degree of sustainability. To combat this a strict fit for purpose policy could be the key to achieving sustainability in any construction project. 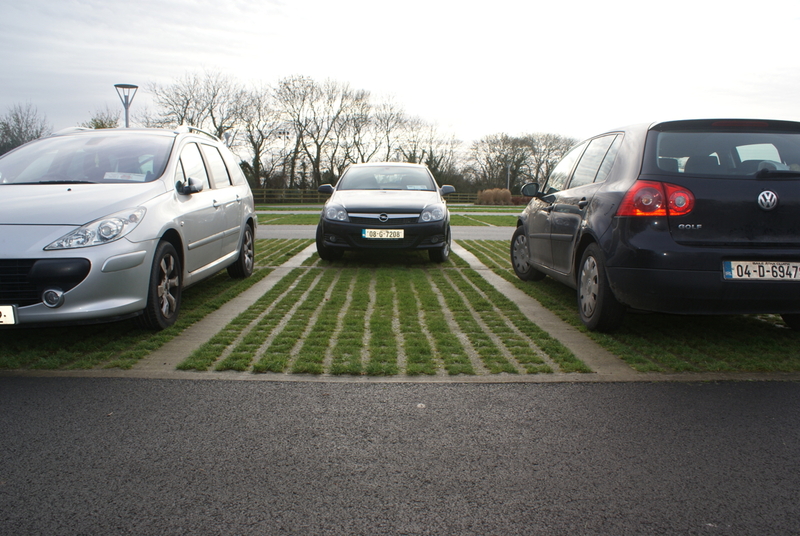 When considering a car park in daily use, will the grass cover and the structure stand up to that sort of regime? If the product is to be applied to a slope, will it function as an armouring layer and will it offer grip? These are the sorts of challenging questions that should be asked to ensure correct specification. This leads on to another question: is the use of grass paving appropriate? 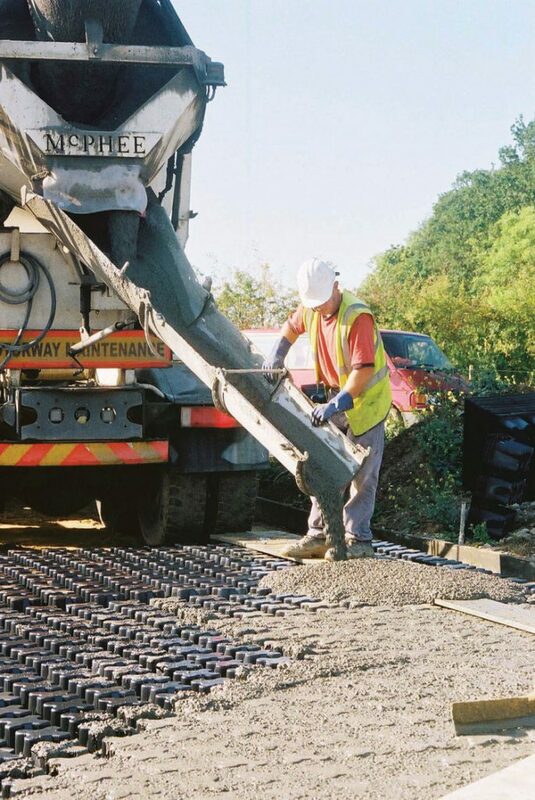 Reputable manufacturers should guide clients to whichever system is most appropriate to their need, be it in situ concrete, pre-cast concrete or plastic systems. This should feature a tailored, fit for purpose response to an enquiry and it also means that inappropriate uses for a particular system are minimised. When considering a design there are a few golden rules that can help the process if applied as a checklist. 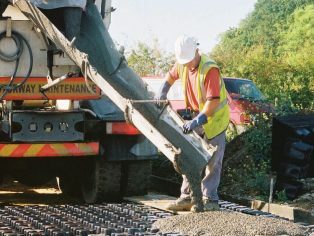 “The paving will be rarely used” is a common statement often used to drive down the specification to affordable levels. Think about the potential for unplanned heavy use such as from refuse and skip vehicles. For fire protection appliances think about the need for support on what is likely to be saturated ground conditions – emergency access roads on housing estates and commercial properties have to support the weight of the latest fire and access vehicles. Policy in this respect is also shifting towards the use of combined aerial rescue platforms (CARP), a hybrid of pump appliances and hydraulic platforms. This benefits fire brigades in limiting the required number of appliances, but places a requirement on the developer to provide for minimum loads that shift from 12 to 13.5 tonnes detailed in the Building Regulations up to new figures that currently stand at 18 tonnes. Consideration to future proofing design to take account of this trend ought therefore to be made. Many grass paving systems rely upon grass to anchor the system in place, be this through a root network or the skin friction from grass filled joints that help to create a tensile layer. The combination of seasonal variation in growth and frequency of use can often over-stress the grass, which can then see paving units being singularly submitted to compressive loads, so inducing a process of progressive failure. The sustainability of grass cover is best guaranteed by a system that promotes permeability while at the same time ensuring that this process is balanced and not prone to being over-reached in flash rainfall scenarios. The depth and shape of the soil pockets have a critical part to play if grass cover is to be sustained. 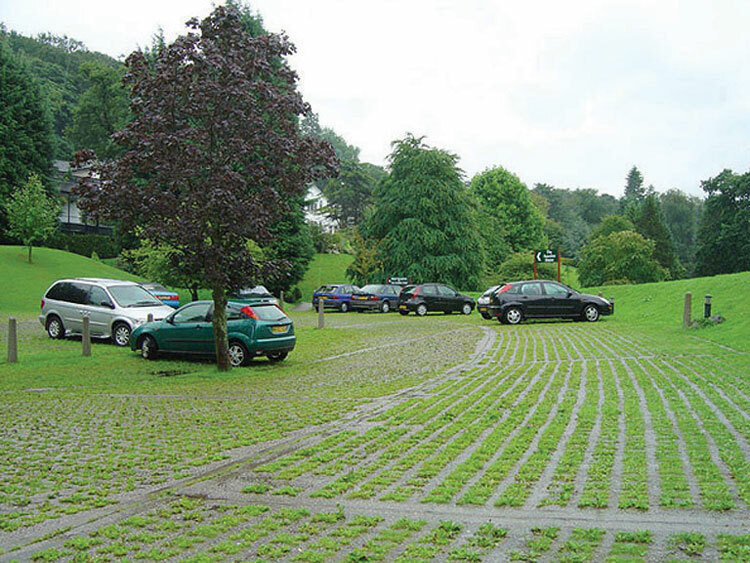 It’s a growing concern to us that we are being increasingly approached by clients looking to replace failed areas of cellular plastic pavers, re-emphasising the need for specifiers to consider fit for purpose systems – this is key to the industry reputation of grass paving. In most instances, ground reinforcement failure often stems from either an inability to accept weight load or an issue of waterlogging causing loss of grass and weakened support; in some cases both of these problems are evident. 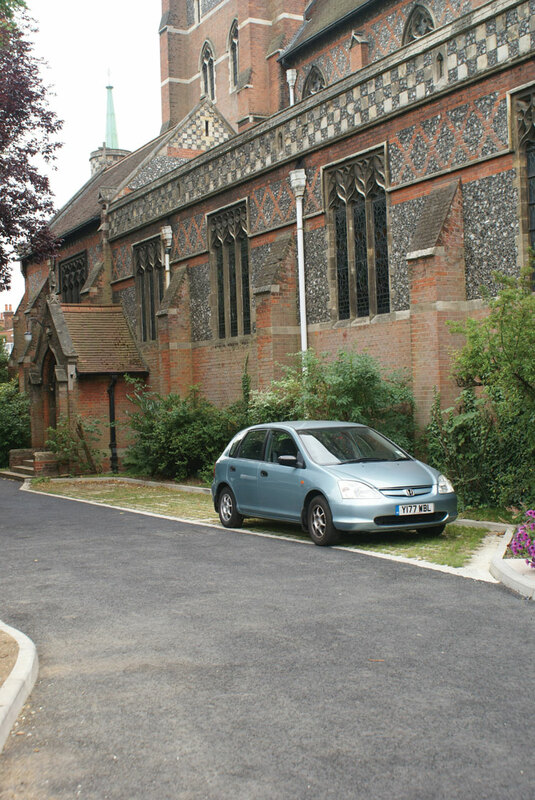 As part of our own commitment to ‘fit for purpose’ we recommend careful consideration of grass paving types, particularly when likely to be subjected to frequent traffic. 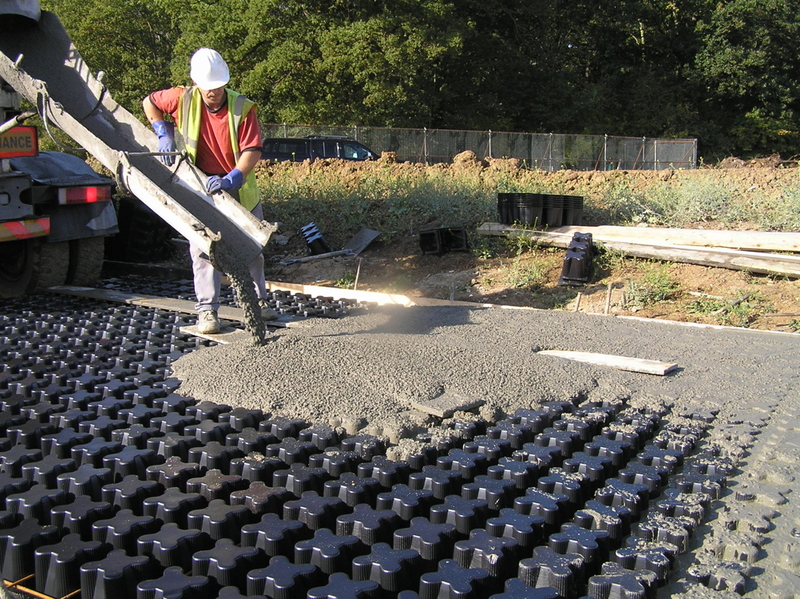 A relatively thin layer plastic paver might appear, from manufacturer’s test information, to match or exceed the capability of structurally designed reinforced concrete. Such test results are for the most part laboratory derived and assume a level of underlying support that sees the units needing to be crushed to fail. This isn’t the normal mode of failure when applied to a job site. This instead is usually by a mechanical failure that sees substrate being pumped through to the surface under a trampolining motion. 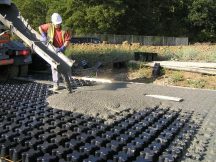 This problem becomes more likely where plastic pavers are gravel infill for traffic use – with no grass to provide tensile anchorage, vibration across the surface will naturally cause a sieving effect that can lead to loss of gravel into the base below or the gravel can also rotate with an abrasive effect on the side walls of the plastic grids. In each case the likely outcome is a break-up of the structure. Critical to performance will be the below ground conditions. For traffic applications we recommend a sub-base. The depth of the sub-base should be based upon the condition of the ground relative to the required bearing capability. Most circumstances will see a sub-base depth of 150mm as being sufficient, this should be proportionately increased where CBR values of 4 per cent or less are encountered. Care should also be taken in specifying the type of sub-base. DOT type 3 materials may suggest high rates of percolation but they will likely as not draw through the sand blind and topsoil fill into the voided structure below. A type 1 material may have a lesser degree of percolation but it provides a greater consistency both in grading and in availability. 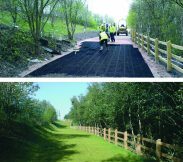 For non-traffic applications such as slope protection works, there is no requirement for a sub-base; on very steep slopes the placement and compaction of a sub-base could in any case be problematic. The key requirement on slopes is to prepare the sub-grade to a reasonable line and level; the finished level will tend to reflect that of the formation level. Excessive use of sand regulating layers should be avoided as this can lead to washout. For watercourses we recommend the installation of a geo-textile of appropriate flow rating below the paving layer. This prevents a loss of sub-grade should any soil pockets be washed out under water flow. Sustainable urban drainage is becoming an increasingly used term with planners and developers seeking to mitigate the implications of handling surface water run-off and its implications for the local storm water network, as well as introducing the prospect of rainwater harvesting for ecological design. With the notion that grass reinforced systems can permeate at up to 90 per cent the rate of natural grass a safe lag time can be achieved. Storing water within the system with low risk of ponding, until the ground can naturally recharge, is a significant benefit but requires a system that can offer a sufficient storage head to avoid surface flooding from “quarts into pint pots” issues. 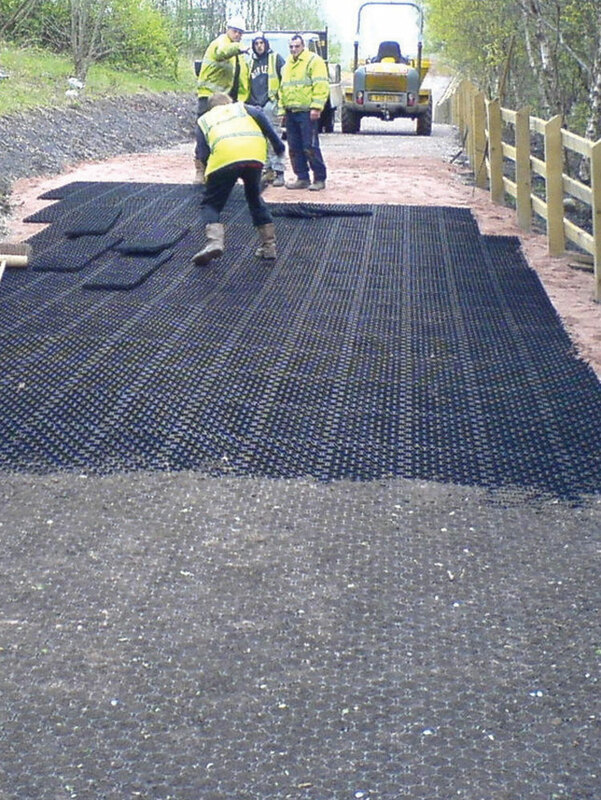 Lag time is beneficial in the prevention of flooding and can be extended by introducing an underlying drainage blanket across the full extent of the paved area. The drainage blanket can be used to either attenuate permeation to the water table or be a vehicle for rainwater harvesting. Our experience tells us that a more uniform percolation process, using a relative thin layer medium across the site can often create a more natural balance. This also helps by minimising the permanent and temporary works implications of digging large holes in the ground. Grass paving systems have an increasing role to play in the development and sustainability of harmonised urban landscapes.